Medellín ended on a soppy note, with grey skies and incessant rain clouding my final morning in one of Colombia’s most notorious cities. With my head feeling as foggy as the skies, I dragged myself out of the sweaty dorm room, put my backpack together and started planning a way out. Arepa. 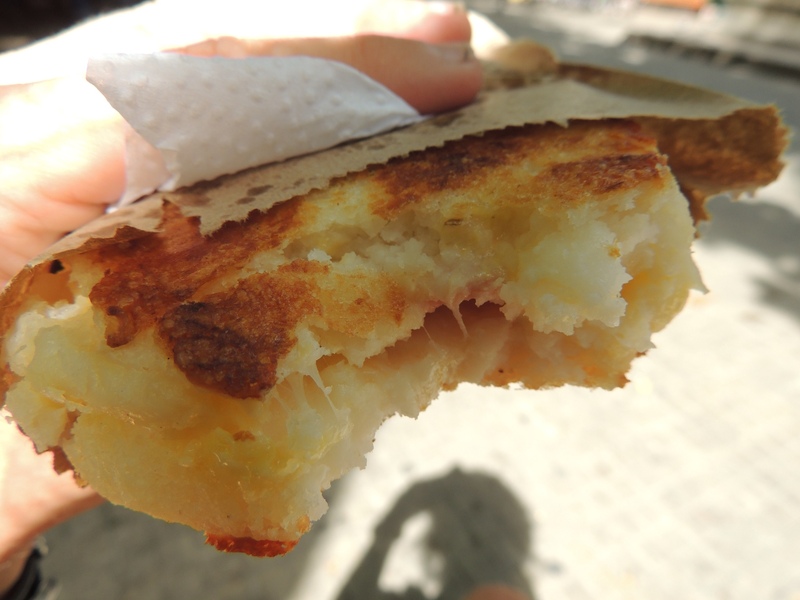 A must-try Colombian food toasted with ham and cheese, smeared with butter. Only for the health conscious. Believe it or not, flights in Colombia are generally cheaper than bus travel. The two main competitors, Viva Colombia and Avianca, offer deals for as little as $40USD when the equivalent cross-country bus ride is an extra 20 bucks and 12 hours (with the possibility of a few extra guns). The hostel wifi hung in there and by 9:00am I’d booked my Medellín-Cartagena flight for $42USD and had given myself just over two hours to make it to the airport – cheap backpacker style. One of the beauties of travelling is waking up not knowing where you’re going or how you’re getting there. a few hours later, we sailed up to 35,000 feet and I demolished an extra lunch thanks to the nice old lady sitting next to me (I didn’t overpower her, she just wasn’t that hungry). Flying into an entirely different part of Colombia was a strange experience – upon exiting the cabin I was greeted with my first blast of warm Caribbean air, making it feel as if I’d just landed in Singapore. The bus from the airport rattled through darkening streets alive with fresh sounds, smells and sights, the locals in the streets giving a distinct Caribbean feel to their home on the northern coast of the continent. I had another reason to be excited. Cartagena would be my last rendezvous with Kyle and Nick before they boarded a boat the next day to make the crossing to Central America. Nick’s bearded grin was there to greet me from the balcony as I wandered into Media Luna hostel, saturated in sweat after five minutes walking through the colourful streets. I completed the usual hostel reception drill (more paperwork than a driver’s licence) and leaned my bag against my concrete bunk bed. Five minutes and one cold shower later, Cartagena was upon us. 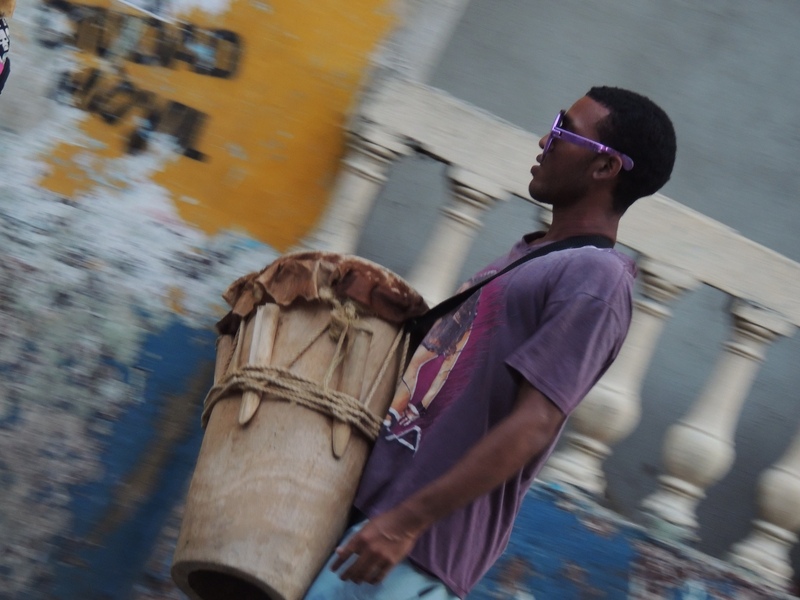 An excitable drummer parades through the streets of Cartagena. Colombia’s lax drinking laws turn the streets into the dancefloor. Locals and tourists mix in plazas under the night time shadows of colonial cathedrals knocking back the local Aguila cerveza and breathing in the barbecue smoke of the street food stands. Around 1 o’clock, the party migrates to the narrow alleyways and the techno nightclubs, blasting a cacophony of sound onto the footpaths outside. If the Caribbean coast knows how to do one thing, it is to throw a party, and the week of the national Miss Colombia contest was no exception. It seemed that this particular section of the gringo trail was gearing up and settling in for a week of guaranteed fun. The Irish girls from Montañita were caught lurking around the hostel and the dreadlocked couple from Mancora were in on the action with brand new hostel jobs on the other side of town. My Pommy travel companion Emily was Couchsurfing in the city and my roommate, a bearded ladies’ man from Isreal, introduced himself as Omri. Plenty of other nocturnal backpackers lounged in and around the hostel pool on a daily basis, until the afternoon’s festivities began and rolled into the inevitably long evenings that lay ahead. 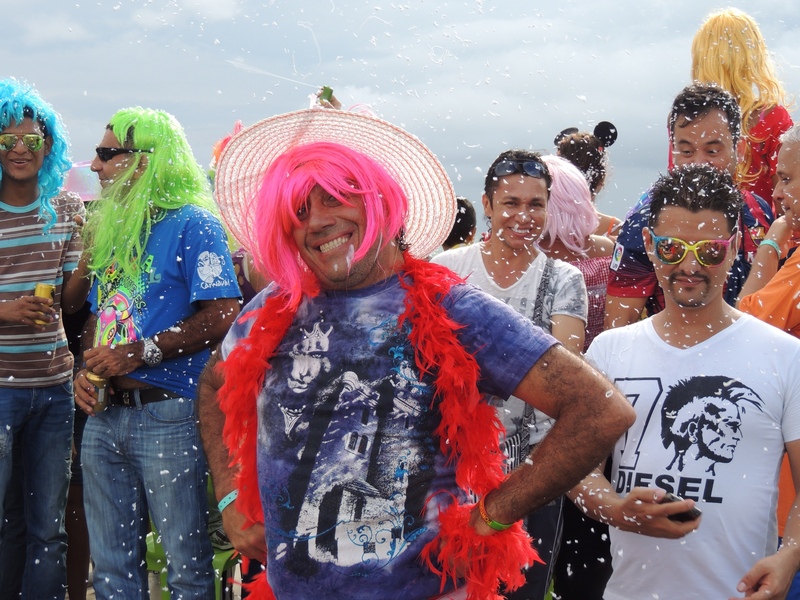 Carnaval costume fun on the waterfront in Cartagena, Colombia. At around 2:00pm each day, the parade would march past the front door singing, dancing and drumming to the delight of crowd-thronged streets. The streets acted as veins into the heart of the party, the seafront promenade, where extravagant floats carried countless beautiful dancing contestants past crowds of thousands. Street sellers sold two-foot cans of foam to be sprayed on unsuspecting victims and savvy locals made an extra buck selling ice-cold beer from polystyrene containers to the thirsty masses. The whole atmosphere was one of loud excitement, albeit loosely patrolled by a heavily outnumbered police presence. On the downside, tourists were undoubtedly targeted, with several stories each day of stolen cameras, purses and even forced ATM withdrawals at gunpoint of up to $1000USD. A time to have fun, but also to be on the lookout. In the time between the fiestas (of which admittedly there seemed very little) we explored the incredible city itself. Founded in 1533, the city was named after the Spanish Cartagena and served as a key economic centre. In 1984, the colonial facades and walled city and fortresses were named a world heritage site by UNESCO. A huge amount of effort has been made to preserve the cities’ beauty, with each of the houses, restaurants and other buildings maintained in a perfect matrix of colour. In stark contrast, on the opposite side of the bay, Bocagrande dominates the city skyline with its hundreds of modern high-rise apartments and hotels springing up from the southern coast. The city is also a popular holiday spot, with easy access to nearby white-sand islands and a resort feel. Apart from the numerous fiestas, Cartagena played host to a few other luxuries. These included my first Hard Rock Cafe ice-cream since my eleventh birthday and some disgustingly delicious deep fried mozzarella sticks at one of the dreadlock’s requests. Culturally, I didn’t overwhelm myself in Cartagena (with good reason) but there could have been no better time or place to spend my first week on the Caribbean coast of South America. Onwards to more white sandy beaches! Enjoy the extensive galleries featured below. How colourful! Looks like the weather is good too. Happy New Year Teddy..I know you will have seen it in in the way only you know how too. Enjoy your travels and stay well J.